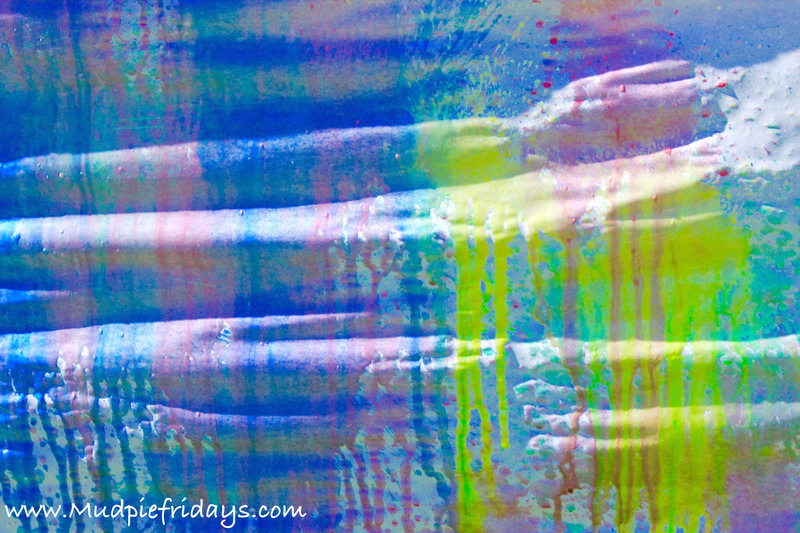 I am guessing when you read the title for this post – Spray Painting for Preschoolers you probably thought I may have lost my marbles slightly! Fear not (although I do think that juggling everything is having a bit of a detrimental effect!) I have not. This is spray painting in the looses sense of the word, but a great Summer activity and one that Monkey asks for regularly. Its easy to set up and can be left and picked up again later on in the day, ideal if you have a little one with a short attention span like mine! 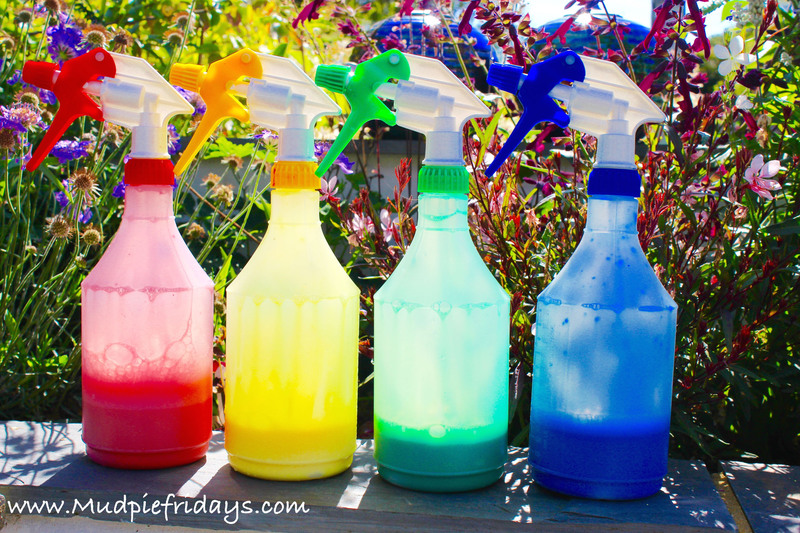 I initially brought some lovely small pint sized coloured spray bottles from Berts for this activity thinking they were just the right size and I could match the paint to the colour of the bottle and it would work wonderfully. However when we attempted to use them it didn’t work as the paint was took thick to be drawn up through the spray (even with added watering down) which resulted in a despondent Monkey! I would suggest buying like we did the more traditional garden sprayers, we got ours off of eBay for a reasonable price (pack of 5) and the levers are coloured so it sort of works. They were a lot more powerful and we have a white one too now for just water (he loves spraying things). I used normal pre mixed paints from wilkinsons for this activity and simply squeezed a good slug into the corresponding coloured bottle and added water. Its up to you how diluted you make it. The thinner it is the easier it will come out of the sprayers and I quite like that water colour effect. So I put around an inch of water in each one. Monkey wanted to mix the paint by shaking them. 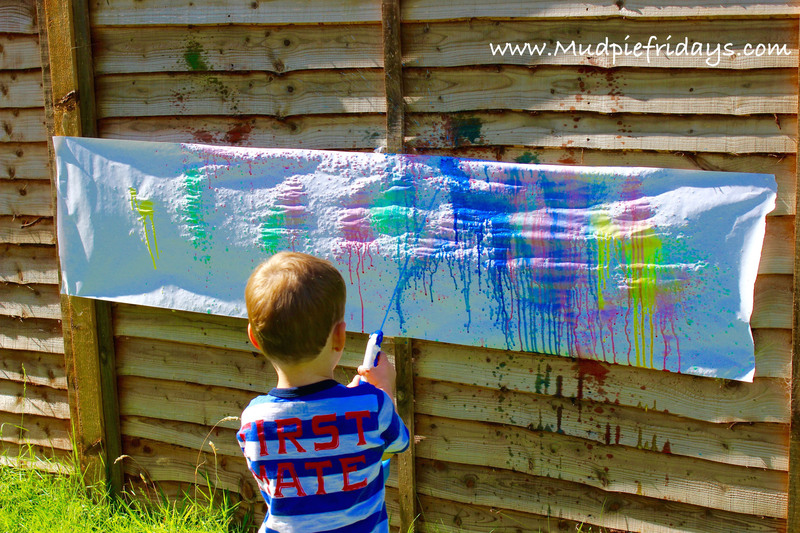 I attached a piece of art paper to the fence, although old wall paper and lining paper would work just as well. The only reason we did it up against the fence is the grass was still damp when we did this. Hubby did mention that the fence is now a little more colourful… but I am sure it will wear off! Next time we are out craft shopping, we are going to get some sea creature stickers to make an underwater picture with the bluer part. It would also make a great book covering too – maybe when I need a new notepad for work, that way it will remind of the fun we had on a sunny early morning spray painting session. 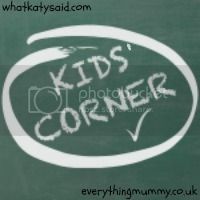 I would love to hear about the creative painting activities you have got up to? How do you think of all these fab ideas?? This is such a fab idea, Oliver would be amazed with this. Its amazing. We use the pool exclusively for outdoor painting, so it never has to be cleaned. I love this idea. I would find it fun myself! 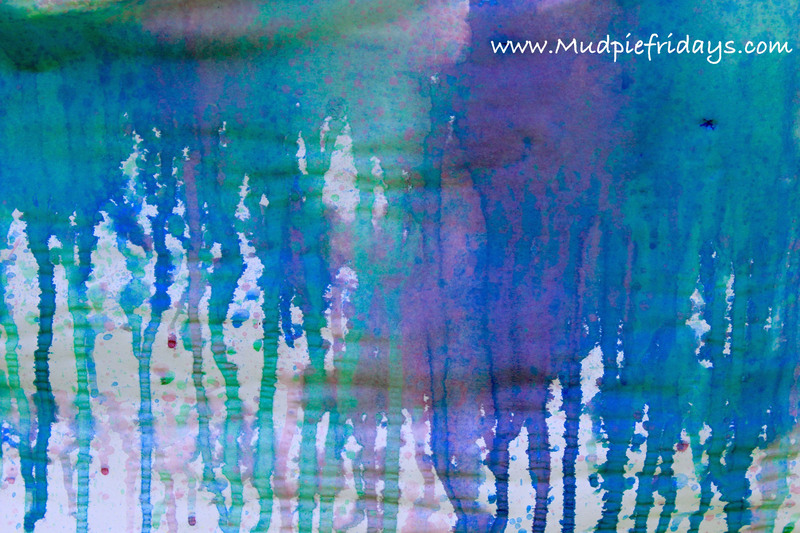 We did some mud painting over the summer…definetly an outdoor activity!